But what about loading? The retracted neck posture shows up everywhere in the world that people carry things on their head, but does it allow them to carry things pain free? In 2010 a review investigating the implications of water carrying for health was written by Jo-Anne Geere (a PT), Paul Hunter and Paul Jagals from the UK and published in the Journal of Environmental Health. They summarized the sparse literature on water carrying in a page and a half. -81.3% of the 107 Indian porters complained of some pain related to their job. The most common complaints were neck pain at the base of the skull (69.7%), a loss of neck range of motion (49.5%), and neck crepitus, ie cracking or popping with movement (48.6%). There was no correlation between severity of degeneration and complaint of symptoms. 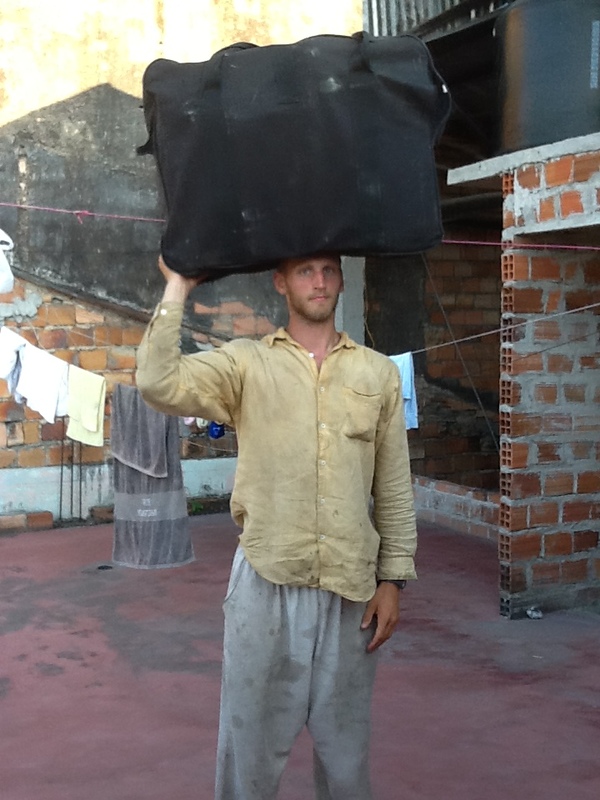 Many of the people interviewed who carry heavy loads on their head report that it hurts their back or neck. (Siddarth 2010, Llyod 2010, Geere 2010). 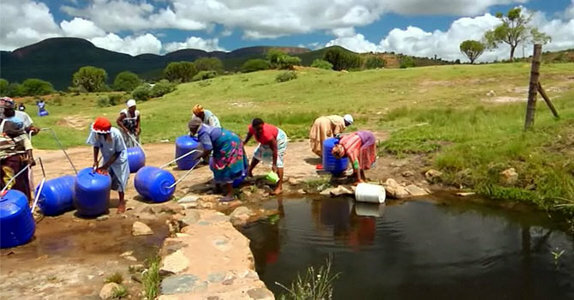 Women in Limpopo region of South Africa carrying water. AVG filled-container weight: 43 pounds. (SD6.1) The heaviest was 60lbs. 69% of participants (20 of 29) reported spinal pain during water carrying. What does this prove? 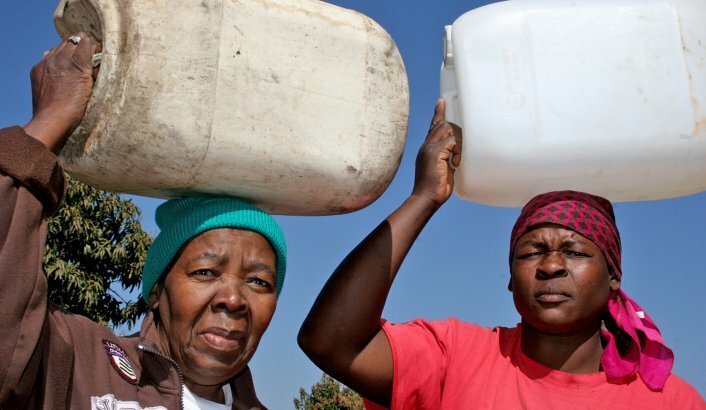 The only thing we can know for sure is that most of the people who have been interviewed in various parts of South Africa (Lloyd 2010 and Geere 2010) and the group in India (Siddarth 2010) said carrying water hurts. Nothing more. 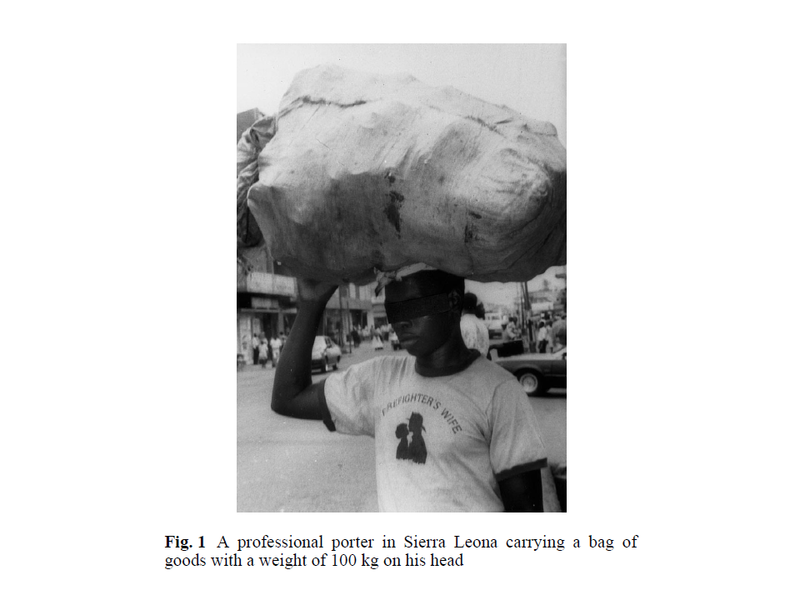 I find it interesting that none of the 35 porters included in the Sierra Leone porters reported any neck pain or discomfort despite significant joint degeneration at a young age. For me it is a reminder not to assume that a task is either painful or pain-free simply based on the mechanics. This x-ray is from a study on coolies who carry enormous weights on their heads (like 100 pounds) in west Africa (Jager 1997). This subject on the right happened to have a straight spine. The subject on the left did not. Both had degenerative changes. The authors unfortunately did not measure the curve in the neck so we don’t know if it had and relationship to degeneration. 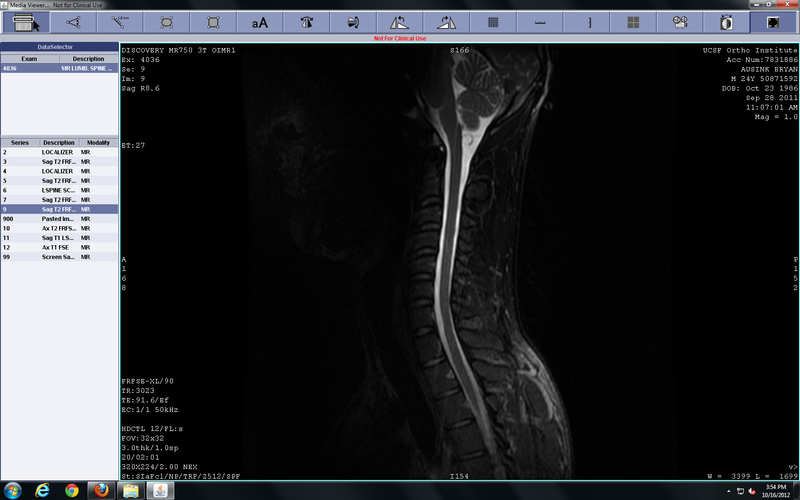 Here is an MRI of my cervical spine from 2010. I am lying down on my back and doing a chin tuck. I was surprised to find that my spine was actually straight. I can’t say that a straight spine is better than one with a smooth curve but it does show that I am not stuck in a curved position. The current evidence is insufficient to answer my question because the authors were not recording neck posture and the methods were not rigorous enough to make any firm conclusions about the relationship between carrying things on the head and pain. We also don’t know how important the weight of the load and the frequency of loading matters here. I suspect it is the critical variable. 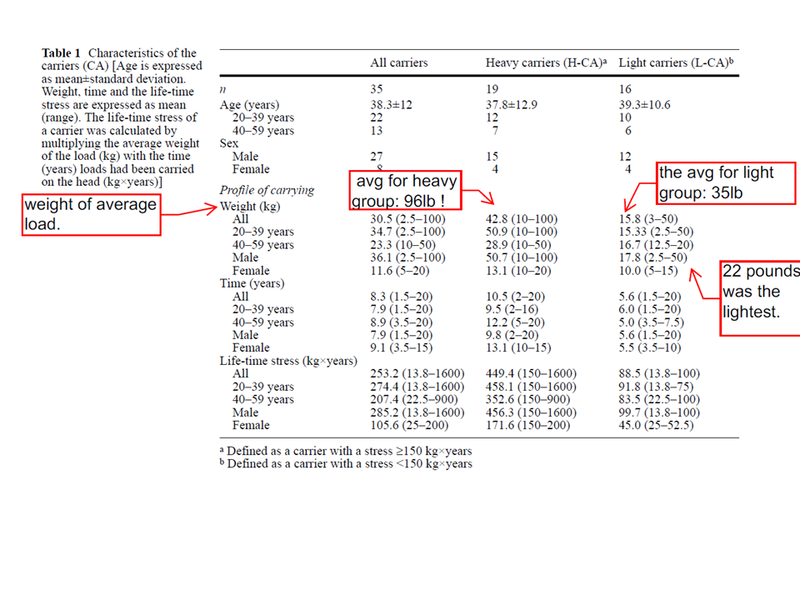 So it seems that carrying heavy loads on your head for years will result in more rapid cervical degeneration. 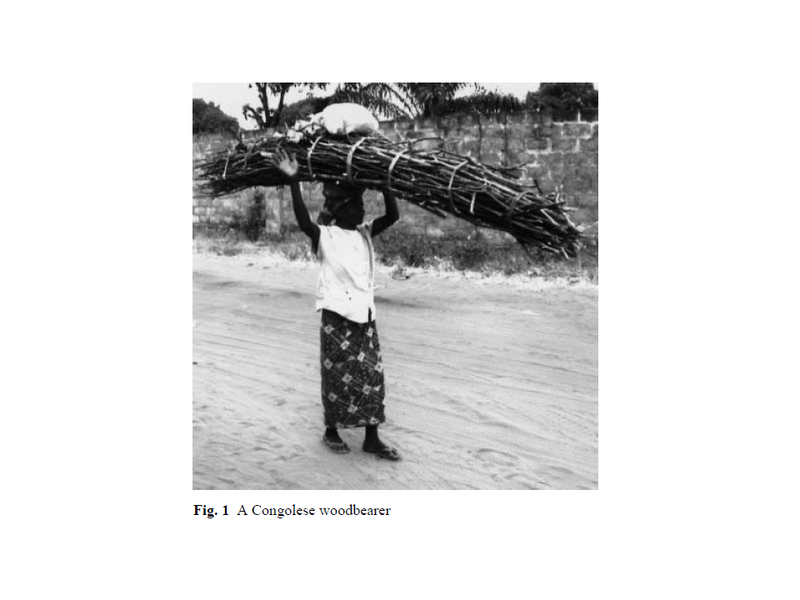 Although this degeneration does not correlate with symptoms, the current state of evidence indicates that many people who carry heavy loads on their heads do find it painful. At this point I would like to mention the perceptual nature of pain. Whether one finds a particular movement or behavior painful is closely related to how one view that behavior. If a child views carrying water as a lowly chore, or an adult views it as a symbol of their poverty they may he more likely to find it uncomfortable or even painful. I use head loading to carry awkwardly shaped (and often heavy) objects short distances, such as a 50lb, 62″ box through a crowded airport or dock. I’m not worried about this activity causing pain or damage because 1) I do it infrequently, 2) I use what I believe to be the optimal posture for carrying loads on the head, and 3) I have a lot of fun doing it. Me at with box-full-o-tandem-bicycle on my head. I suppose I could hire people to carry it around for me but taking more of the burden on myself makes me feel more abled. See my post on the human-environment interaction and disability for more on this. The hippo water roller looks like a great solution to reduce the amount of cervical degeneration caused by carrying heavy loads of water on one’s head everyday from a young age. head. 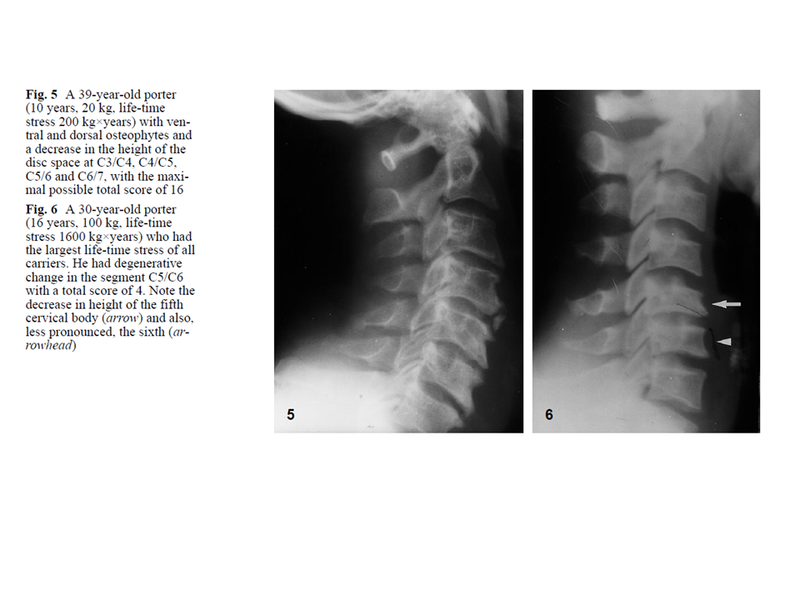 Skeletal Radiol 1997, 26:475-481.
and cervical spondylosis in Ghanaians. West Afr J Med 1994, 13:181-182.
and tolerance. Biomed Sci Instrum 2001, 37:435-440.
on the head and back in Xhosa women. Appl Ergon 2010, 41:522-529.
during complex lifting. Spine J 2003, 3:93-99. 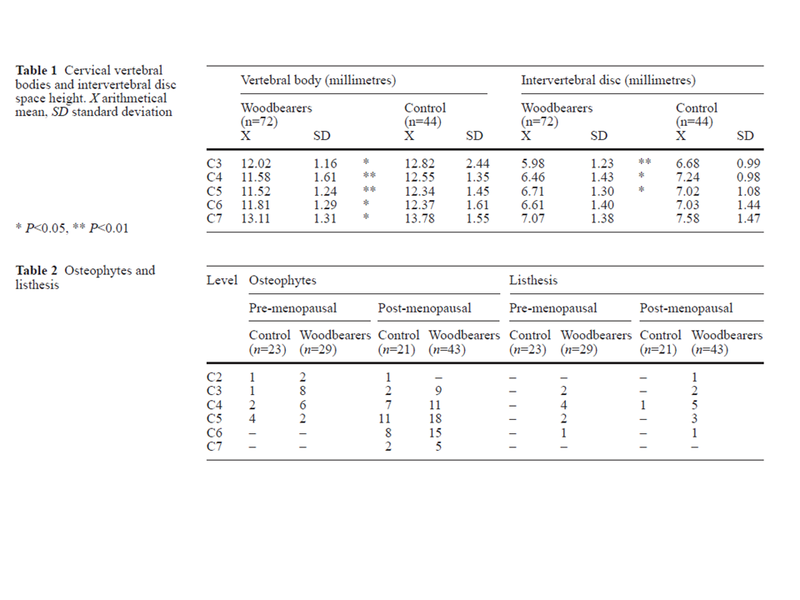 Marras WS, Davis KG, Jorgensen M: Spine loading as a function of gender. biomechanical integrity of the developing cervical spine in compression. of the maturing cervical spine. Stapp Car Crash J 2002, 46:431-440.
vertebrae of size-matched volunteers. Spine 2008, 33:E44-49. segmental kinematics during whiplash. J Biomech 2003, 36:1281-1289. Hi, this seems a fair summary of our review and quite sensible views to take from it and the other information you have collated. Thanks for acknowledging our work. We have done a little more research now, hopefully will understand the complexity of the issues a bit more from it and aim to be publishing in the next year or so. If you are still interested in the topic another good review was recently published by Porter et al ‘Health impacts of pedestrian head-loading: a review of the evidence with particular reference to women and children in sub-Saharan Africa.’ Authors Porter G, Hampshire K, Dunn C, Hall R, Levesley M, Burton K, Robson S, Abane A, Blell M, Panther J. Journal: Soc Sci Med. 2013 Jul;88:90-7. doi: 10.1016/j.socscimed.2013.04.010. Epub 2013 Apr 17. Thanks for the update Jo, I look forward to reading your upcoming report! I am very curious to find the balance between what appears to be the dangerous sedentary behavior of the developed world and the dangerous repetitive loading of the developing world.